Initially intended to more closely integrate the au pair into the life of the family, the unit carefully maintains a sense of autonomy and privacy for its occupant as well as the main house. As the children mature, the space will likely welcome an aging grandparent. The main house cues an unencumbered modern aesthetic with significant clear-span ceilings and abundant natural light. We created the sense of uninterrupted space first by eliminating a center post and flush framing the central support beam for the garage above. The feeling is reinforced by positioning the new floor flush with the existing deck. this allows an ample, if not generous 96” ceiling height. 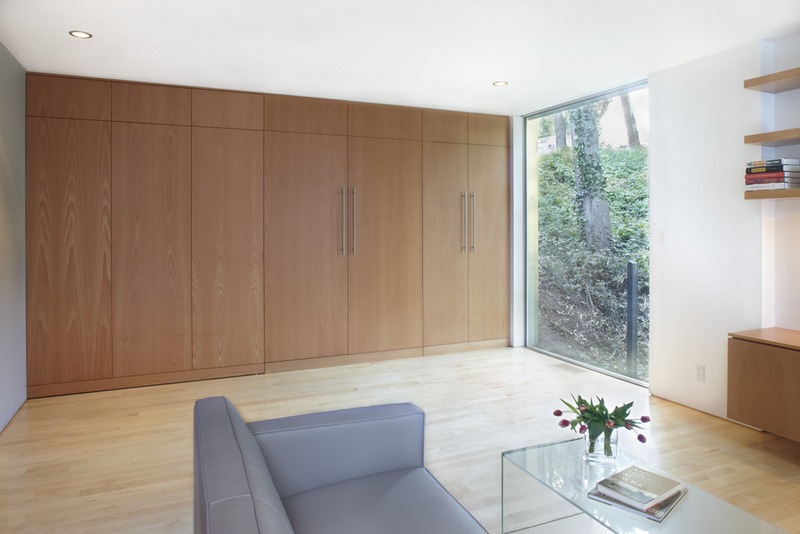 Floor to Ceiling windows draw in an abundance of light and reinforce a sense of spatial continuity. The clear picture window facing the forest viscerally extends this sense to the exterior. Along the entry wall, translucent white laminated glass maintains the sense of privacy without compromising natural light – even when acting as the only separation between the ‘public’ deck and the naked person in the shower (wink). 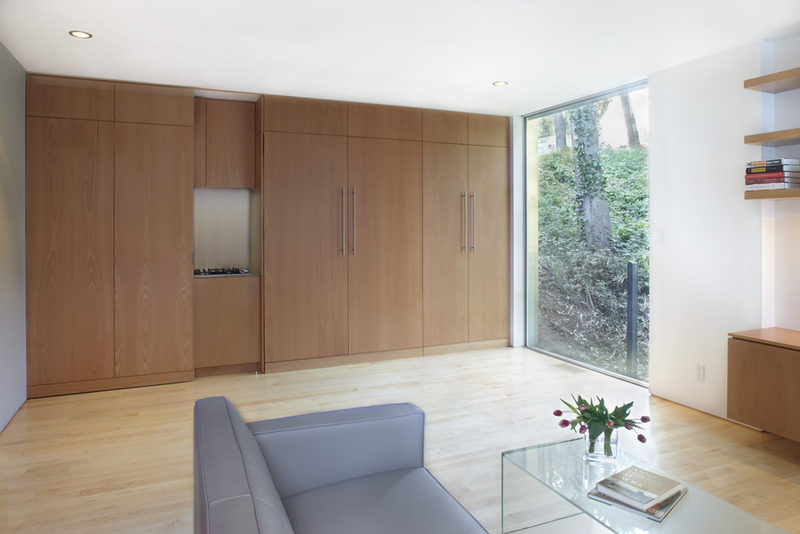 Sleeping, cooking and storage functions nest in a wall of cabinetry that defines the entire width of the main space. 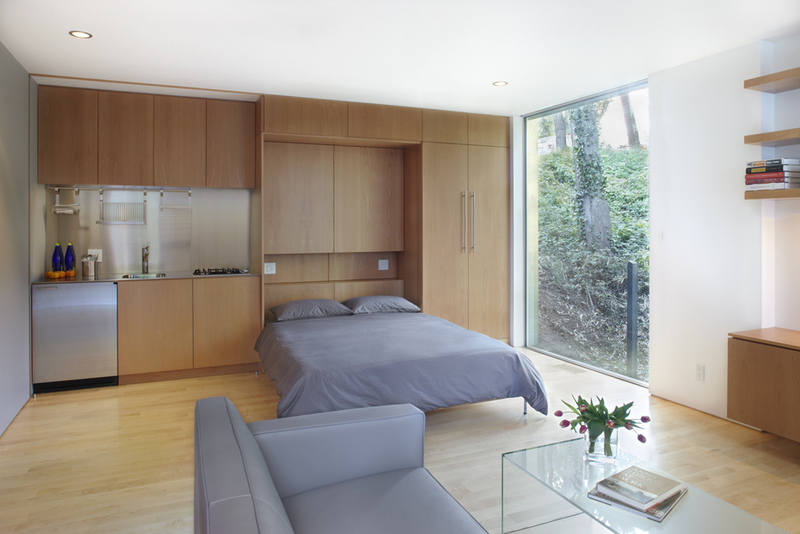 Opening the large pocket door and lowering the murphy bed reveal the full function of a studio apartment. With these elements contained, the space encourages a range of other uses from office to party, to simply sitting.